Body temperatures of pretreated mice during IgG1-induced PSA in FcγRIIB-/- (n=6 per group) or WT (n=4 per group) mice. (B,C) Analysis indicates the total distance was unchanged between cuprizone-exposed mice with or without clemastine treatment (B), but the distance in the central field decreased upon 6-week exposure to cuprizone, while clemastine gradually rescued the behavioral change (C). *P <0.05, n = 10 animals/group. Hydroxyzine Pamoate is the pamoate salt form of hydroxyzine, a synthetic piperazine histamine H1-receptor antagonist with anti-allergic, antispasmodic, sedative, anti-emetic and anti-anxiety properties. 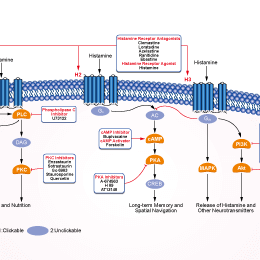 Ranitidine is an H2 histamine receptor antagonist that works by blocking histamine and thus decreasing the amount of acid released by cells of the stomach. Chloropyramine hydrochloride is a histamine receptor H1 antagonist and has anti-cholinergic, antispasmodic, and antiallergic effects. Diphenylpyraline hydrochloride is the hydrochloride salt form of diphenylpyraline, which is an antihistamine used in the treatment of allergic rhinitis, hay fever, and allergic skin disorders. Acrivastine is an antihistamine medicine that relieves the symptoms of allergies. Emedastine is a potent, high affinity histamine H1-receptor-selective antagonist with Ki of 1.3 ±0.1 nM for H1-receptors while considerably weaker at H2- (K1 = 49,067 ± 11,113 nM) and H3-receptors (Ki = 12,430 ± 1,282 nM). Emedastine Difumarate is the difumarate salt form of emedastine, a second generation, selective histamine H1 receptor antagonist with anti-allergic activity. Triprolidine Hydrochloride is the hydrochloride salt form of Triprolidine, which is the first generation histamine H1 antagonist used in allergic rhinitis. Cloperastine is a drug with a central antitussive effect, and is also endowed with an antihistaminic activity. a, Quantification of sterol levels in OPCs (oligodendrocyte progenitor cells) treated with the indicated molecules at 2 μM. b, Quantification of sterol levels in OPCs treated with the indicated previously reported enhancers of oligodendrocyte formation (n = 2 wells per condition except DMSO, n = 6). Representative of two independent experiments; for concentrations, see Extended Data Fig. 6g. c, Quantification of EBP enzymatic activity in a biochemical assay. All treatments 10 μM. n = 3 independent enzymatic assays, except DMSO, n = 5. Bars indicate mean; error bars indicate s.d. Sigma H127, p-fluorohexahydro-sila-difenidol. Betahistine is an antivertigo drug that primarily acts as a histamine H1 agonist. Betahistine mesylate is the mesylate salt form of Betahistine, a histamine analog and H3 receptor agonist that serves as a vasodilator. Histamine, an organic nitrogenous compound, is involved in local immune responses regulating physiological function in the gut and acting as a neurotransmitter for the brain, spinal cord, and uterus. It is a potent H1 and H2 receptor agonist.